Yousef Mohammad Al-Briek Al-Dossary EST. 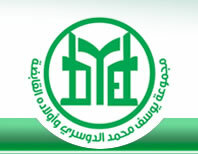 Founded in 1950 by Sheikh Yousef Mohammad Al-Briek Al-Dossary as a contracting organization that has contributed to the development in the eastern region in terms of the establishment of numerous infrastructure constructions, especially roads. Organization's business has expanded into real estate and real estate development and the establishment of residential and commercial buildings. In 1985 the Establishment head to the Industrial Business where purchased AlBanjer Plastic Factory , in 1990 establish Al-Sharq Polystyrene Factory and in 2009 was set up Anjad for advanced Plastic industries Factory .the establishment has developed and expanded the institution to the activities of oil services and Restaurant and cafe shops chains management and other various activities.